I enter the Paonta Sahib gurudwara to a heavy swash of water from a hose pipe held by a burly nihang who is washing the walkway. Unmindful of my disapproving looks, he aims the hose pipe closer to me and as the seems to enjoy it, he chuckles and exchanges a mischievous smile. The marble floor is wet and slippery and as I walk, I struggle to maintain my balance. Had the nihang not come to my rescue and helped me on my feet, I would have surely got a taste of his scrubbing prowess. 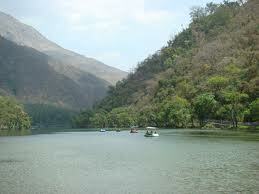 Poanta Sahib is a small prosperous town with an elegant market and many well built homes. Situated on the banks of the Yamuna in Himachal Pradesh, the city was first inhabited by Guru Gobind Singh in 1685. it was here that Guru Gobind Singh fought his first battle of Bhangani against the neighbouring rajas of Bai-dhar. The Guru had come to Paonta Sahib after being gifted the land by the Raja of Nahan to engage in spiritual writings and very soon the city became a centre of business and literature. On hearing about the presence of the Guru, sikh sangats gathered here in due time. 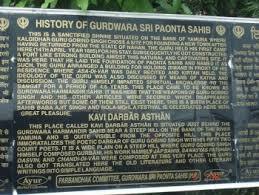 The Guru held diwans and the sikh warriors held martial art displays. Poets held contests here and soon an isolated place was turned into a popular city. Deras, cottages and tents could soon be seen here in large numbers. The Guru imparted training to the sangat in swimming, bathing, martial exercises and in the hunting of tigers and lions. It is claimed that no other town in the world was established in such a short time of two months. 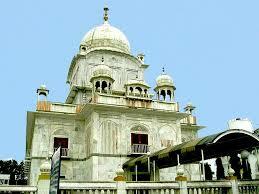 The Gurudwara at Paonta Sahib has some interesting places which one must see. The Durbar hall is the main hall where the Guru first came and resided. 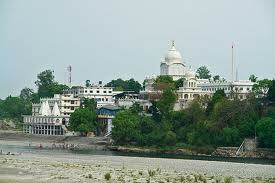 The Kavi Durbar is situated on the banks of the river Yamuna where the guru held kavi sammelan on every Poornima night. The Kalparishiasthan was built by the Guru in the memory of a saint Kaparishi, who had a vision of the almighty at Kalsi near chakrata. The Dastaarasthan is the place where the guru gave his disciples training in the art of tying the turban. 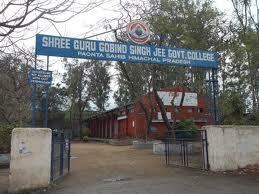 In addition, the Gurudwara has many residential rooms and halls. There is a large langar which remains open for 24 hours and provides food to the hungry. But the library and the museum are the most attractive part of the gurudwara. The museum reportedly has the largest portraits in the world of Guru Gobind Singh and has several paintings depicting the sacrifices of the Sikhs to uphold their honour and fight for the cause of their religion. Guru Gobind Singh stayed in Paonta Sahib for a period of four and a half years, the maximum period he stayed anywhere during his lifetime. By evening, a dust storm and light showers have engulfed the city and as I leave the gurudwara, I look back and watch the victory mast flag which flutters proudly with the sikh emblem emblazoned boldly on it.